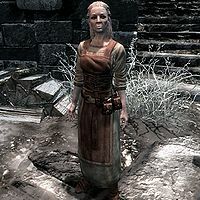 Viola Giordano is an Imperial citizen who has a house in Windhelm. She pines after Captain Lonely-Gale, but her feelings towards him are unrequited, as he spurns her advances every time she asks. After raising Viola's disposition, she becomes a potential candidate for marriage. Viola's outfit consists of clothes and a pair of boots. She is equipped with an iron dagger and carries around her house key as well as a selection of common loot and gold. "Be on the lookout. The Butcher could be around any corner!" "After what happened to those other women, I'm worried about my own safety." "Women murdered time and again, and all the guards care about is the war." "Be careful! That murderer could be anywhere, and anyone." During the quest, you can ask her about the Butcher. She will explain: "I've been following him for months now. Well, not actually following. Trying to find him. The guards won't help. The people won't help. I'm the only one who thinks he can be caught." If you ask her about why the people don't care, she will go on to tell you: "Oh, they care all right. Just none of them thinks to do anything about it. They say I'm just snooping around bothering people, but I'm trying to save lives!" Also asking her why the guards won't help, she will elaborate: "They say they're too busy with the war -- I say what good is winning a war if we're still terrorized by one of our own?" If you then tell her that you have one of her flyers from Hjerim, she will tell you: "I've been trying to put those up around the city, to warn people. Have them keep their eyes open. But someone keeps taking them down. You say you found it in Hjerim? Friga's old place. Let's go have a look around there. I've got a feeling about this one." Once you meet her there, you will begin to investigate the house for any clues. She will also comment about one of the cabinets within the house: "Look here. There's something strange about this cabinet." Investigating it further, you will find a secret room along with the Butcher Journal #1. When you show Viola the journal, she will immediately ask you about its contents. When you suggest to her that the court mage has been experimenting, she will tell you: "Wuunferth. There have been rumors swirling about him for years. As long as I can remember. But he's a dangerous man. It's why they call him "the Unliving." I wouldn't approach him directly. This information needs to go straight to the steward. He'll listen to you." If you also show her the strange amulet, she will say: "Nothing anybody I know would wear. Maybe ask one of the Dark Elves, they usually have some kind of rag falling off of them. The one who sells things, what's his name. Oh, yes! Revyn Sadri. Maybe he'd know something." During the quest, if you decide to tell Viola about the ring, she will say: "Oh, really? So that Dark Elf took my ring. So typical of his kind. I think the Jarl should hear about this. Maybe double his taxes. No, triple them. That should teach those people a lesson. You deserve something for sniffing out that thief. Here." She will then reward you with a leveled amount of gold and becomes a possible candidate for marriage. She is the author of the flyer Beware the Butcher! If Viola dies before completing Blood on the Ice, the quest may not start or will be impossible to finish. It is possible to remove Butcher Journal #1 from the player's inventory if the house is broken into and the book found before following Viola. She must see the book in the inventory for the quest to proceed. ? This page was last modified on 27 September 2018, at 09:52.